Former and current professors also not talking. Richard Price demonstrates his Measurement of Accuracy when Resin Curing (MARC) system. 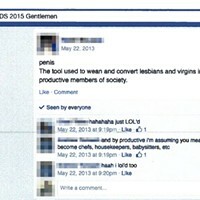 Price is named by the Class of DDS 2015 Gentlemen Facebook group as under scrutiny for sexual harassment. That’s what one Class of DDS 2015 Gentlemen wrote this past spring. He’s referring to current dentistry professor Richard Price, and former Dalhousie professor Arturo Merino. They’re two of four dentistry faculty members named in the misogynistic Facebook group that’s rocked the university. Merino was employed by Dalhousie at least until July of 2012 as a professor of endodontics, while also working in the school’s dental clinic. He now splits his time between a few different clinics in Spain’s Badajoz province. After multiple phone calls, The Coast was finally able to reach Merino by email and ask him whether he had been investigated for sexual harassment and why he no longer was teaching at Dalhousie. We’ve received no reply. Another current Dalhousie dentistry instructor mentioned in the group is Wayne Garland. 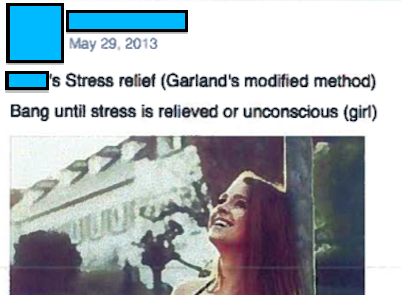 The assistant professor is named in a post showing a photo of a woman and a recommendation to “bang until stress is relieved or unconscious.” The post’s author claims that’s “Garland’s modified method” of stress relief. “I don’t think he’ll be calling you back,” said the woman who answered the phone when The Coast tried calling Garland’s office line. “Thanks for phoning,” she added before hanging up. One person who did return our phone calls was Jon Bruhm. The alumni officer for the faculty of dentistry is also a former journalist and was a writer for The Coast from 2002 to 2006. When contacted, Bruhm hadn’t been informed by Dalhousie he was mentioned in the Facebook group. “My goodness, that’s the first I’m hearing about it,” he says. Bruhm’s name only comes up when one of the “gentlemen” praises him for having a “hot” assistant and ponders inducting him into their group. Another states Bruhm says “gentlemanly things” sometimes. Categorically, Bruhm says he’s had no sexual harassment or code of conduct complaints made against him. He also says he isn’t aware of any complaints against any other dentistry faculty members. The posts mentioning Merino, Price, Garland and Bruhm all date from before this summer, when a male dentistry professor showed a video of bikini-clad women to “wake up” the men in his class. The Coast doesn’t know the identity of that instructor. Brian Leadbetter, Dalhousie’s director of communications, has refused to comment on any of the specific allegations about faculty members. In December, he claimed not to be aware of any faculty sexual harassment complaints or investigations in the dentistry school during the past nine months he’s held his job. Specific questions about Richard Price and Arturo Merino were put to Leadbetter on January 9. No one would label the ramblings made within the controversial Facebook group as mature. But given the public outrage about the content—and the severity of some of the accusations—we wanted to offer Dalhousie and the instructors involved every opportunity to defend themselves. Save Bruhm’s solitary and emphatic denial, everyone else has refused to comment.